The latest round of U.S. Mint sales figures offer early results for the new collector coins depicting Massachusetts’ Lowell National Historical Park. 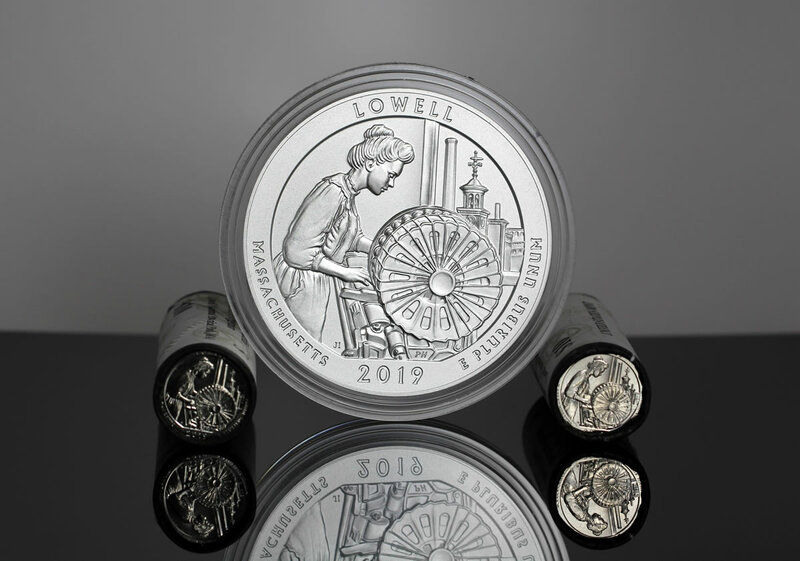 Released last week on Monday, Feb. 4, the Lowell quarter is the first of five issues for 2019. Available products include rolls and bags of quarters from Philadelphia, Denver and San Francisco with mint marks of ‘P’, ‘D’ and ‘S’. By itself, the half dollar set climbed another 9,770 units and it’s currently unavailable. The set has its own product limit of 100,000 and 94.1% of them have now sold. In its latest report, the U.S. Mint published sales data for 105 numismatic products. Sixty products outperformed their prior weekly gains against 43 previously. Not counting the new Lowell quarters and coin, 9 products increased by more than 1,000 units against 12 in the previous report. In addition, 3 products saw their sales reduced compared to 1 previously. Two products fell sharply. The 2019-W Proof American Silver Eagle sank by 16,059 coins and the 2019-P Proof Apollo 11 Five Ounce Silver Coin declined by 883. Below are tables showing the latest sales for U.S. Mint numismatic products. The sales period covers from Feb. 3 to 10. Products with an asterisk (*) are no longer available or had no reported sales. Thank you for your weekly update. Will be interesting to see if the 5 Oz Apollo sales will drop next week. Apollo sale down & they got alot of RETURNS the Mint really f;d up the whole Apollo11 thing…..I cancelled my 5 coin Pucks regardless……never, never will make $ on it unless AG hits $40! One hell of a good insect looking mess. Mike Mezack will sell a lot of this junk..Repeat Repeat Repeat. At 94,119 The Apollo 11 Half Dollar Set is currently unavailable. I received the Lowell 5oz PUC the other day and I understand why it isn’t burning up the coin world. Pretty Ho-Hum coin, sadly. I have the entire series so far, so I’m all in to the end, but some of these designs just don’t do it. The Apollo commemoratives’ sure seems like a fiasco. Who ever was responsible for having (coins on hand,) blew this one. The Apollo 11 Half Dollar Set is Sold Out! i dont remember when i started collecting Kennedy half’s. 3 new ones a year for years. i would have to go count how many different coins. i have had to buy over the past 3 years. to keep my set complete??. will this coin set ever end.